STAR TREK At 50: The Animated Series - The Magicks of Megas-tu | Warped Factor - Words in the Key of Geek. Matthew Kresal dabbles in a little bit of magick. 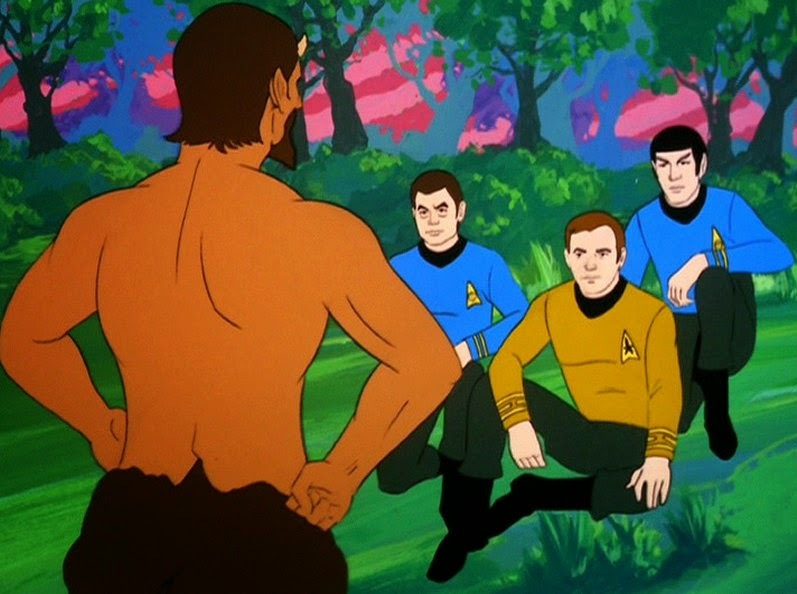 Star Trek's brief animated run in the early 1970s is often overlooked these days. It certainly had the shortest run of any of the Star Trek TV shows, lasting 22 episodes across two seasons. Yet it was not without its highlights, such as Yesteryear which explored Spock's childhood. Another would be The Magicks of Megas-tu, the series eighth episode and one that would explore some interesting territory for what was largely considered a show for children. The Enterprise is sent on a mission to the center of our galaxy to explore the possible forces of matter creation there, the ship and its crew are caught up in a whirlwind caused by those forces. Ushered into a realm where the usual laws of physics don't apply, they encounter a being named Lucien, who resembles Pan from mythology, who explains and eventually hides the Enterprise crew from the rest of his people. As the crew discovers, the Megans came to Earth in humanity's ancient past in an attempt to be beneficial but were met instead by greed and fear which culminated in the Salem Witch Trials. Humanity finds itself on trial in the form of the Enterprise crew with a last battle of magic to determine the fate of Lucien. Larry Brody's script (which was given a heavy rewrite by Gene Rodenberry) is full of fascinating ideas, many of which seem familiar from other Trek incarnations. The journey to the center of the galaxy leading to the discovery of a supernatural being calls to mind the later Original Series cast film Star Trek V: The Final Frontier. Indeed that film's original concept of Kirk and crew effectively discovering the devil is the same here, though Brody was apparently able to get away with it on a Saturday morning cartoon. The middle and final parts of the episode also call to mind the third season story Plato's Stepchildren, though the ideas are both better written and better executed here thanks to animation not suffering from quite the same limitations as the live action series. The trial scene in a court from Earth's past also calls to mind Q's court in the bookending episodes of Next Generation and moments from the Original Series run as well. Also intriguing is the use of magic and items from mythology. 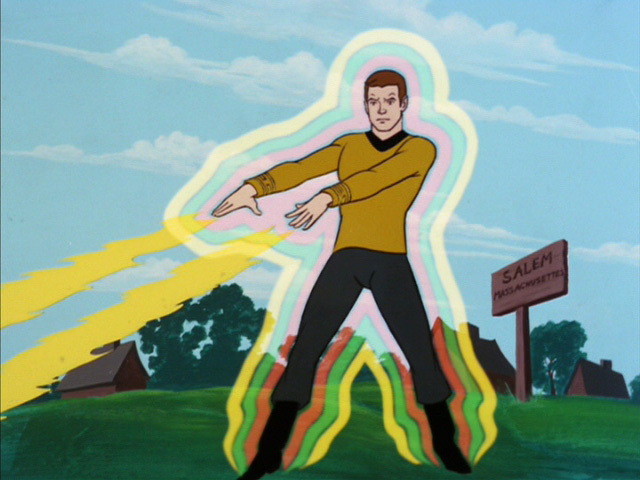 Star Trek has played with the idea of magic both with success (the Q character) and with less than stellar results (Catspaw from the Original Series). The setting of a world on the edge between universes is a neat one and it allows for the episode to do magic seriously without undermining the basic science fiction premise of Trek. The episode also makes good use of mythology and symbolism, which pre-echoes Star Trek V and, perhaps due to the more condensed running time of 23 minutes, works in a more satisfying manner here. The final scene with an intriguing intellectual punchline works incredibly well and would likely be a brave move for the franchise today, let alone more than four decades ago. Yet like so much of Star Trek's animated run, it continued to be hampered by production values. All too familiar stock shots of the Enterprise are used again and again in the early parts of this episode with effects simply superimposed over them, even as identical shots are repeated. The tendency to let things be played in silhouette or with a lack of detail is present as well, as are occasional goofs which mar the entirety of the Animated Series. Yet the animation here might be the strongest in the entire run, especially the pitch battle at the finale. While still confining the series potential, this episode suffers from it perhaps less than others. In the end, The Magicks of Megas-tu stands out as one of the best episodes of Trek's animated run. It's an episode that explores intriguing territory that pre-echoes what later incarnations of the series would do and even surpasses those later efforts in places. Though hampered by the quality of its animation, like Yesteryear before it, it nevertheless shows the potential of taking Trek into the animated frontier.